I’ve been married for 16 years and have 3 kids. If I could, I would make a living out of health and fitness. It’s just so fun to experience as a family, and I love having goals to help me in my health and fitness journey. You became a self-proclaimed workaholic shortly after you got married and it sounds like it took a toll on your family and personal life. What advice do you have for people to achieve a better work-life balance? To never lose sight of the things that truly matter in life, and if you do lose sight of them, remember that it’s never too late to start fresh. Two-and-a-half years ago, I had to start over. Ideally, it would not have come to this, but I’m so grateful that there are second chances. Now, I strive to keep everything balanced. Sure, it would be great to workout 7 days a week, but I have a family to provide for, to love, and to be present with. I have to get creative by involving my family in my health and fitness. What was the turning moment that made you decide to start training for American Ninja Warrior? After my wife told me that things were over until I made major changes in my life, I began by drastically changing my work habits. I turned my business over to my brother and got a 9-5 job. I spent a few months settling into a new daily routine and started to think about whether or not it was time to give some much-needed attention to my eating and exercise habits. At the time, I had major back issues, as mentioned above. As I thought about beginning to take health and fitness seriously, my back was always my excuse for why it was a futile effort. 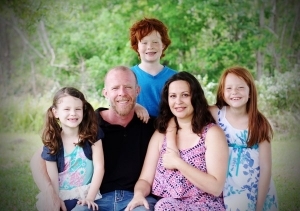 In May 2014, we were watching American Ninja Warrior as a family and my then 9-year old son said, “Daddy, you could do that!” My initial thought was, “Son, I can’t even get up off this couch without taking 30 seconds to slowly stretch my back.” But in that moment I realized that what I could not tell my son was, Son, there are just some things in life that are not possible.” The next morning I called a friend of mine who was a personal trainer. Eric had been telling me for a couple of years that he could help me if I would put in the time and effort, so I said, Ok, dude, I’ll give you a month to see if you can get my back to a point where I can start to exercise without pain.” And the rest is history. How did you overcome those self-doubts after your son told you he thought you could make the show if you trained for it? As I said, my back. I had surgery pretty much right out of high school, so my back has been a crutch for a long time. But I’ve learned through this process that a journey is made of a lot of baby steps. Was I discouraged when I went to the gym day-one and had to put 70lbs on the pullup assist machine just to do one pullup? Absolutely, but as they say, “Rome wasn’t built in a day.” Now I do 100 pullups in 10 minutes a couple of times a week. I didn’t get there by spending 24 hours in the gym for a week. I took it one step at a time, setting small achievable goals, working hard to attain them, and then setting new small goals. How did your training help you become a better husband and father? There are so many lessons learned over the last two years, but I think the main thing that I’m learning how to do is have balance in life. The health and fitness leg of life was non-existent. I was the husband and father who got home from work, plopped down on the couch, and fell asleep to the TV. Training, or more broadly health and fitness, has helped me in that I have energy for my wife and children when I get home from work, and that has helped bring balance to our home. 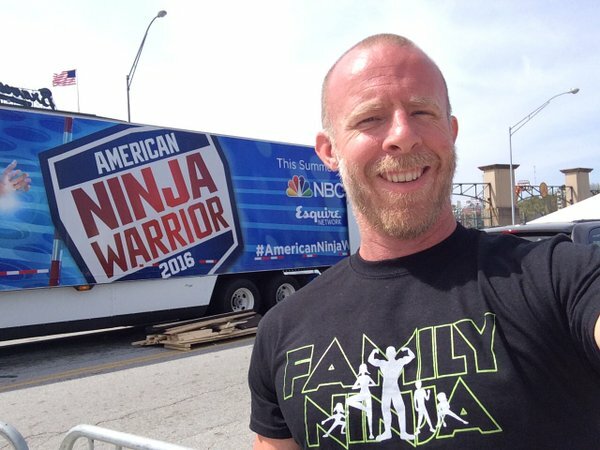 Have you made an application video for American Ninja Warrior? Have you ever done any obstacle course races? What went through your mind when you crossed the finish line at your first ever obstacle course race? My wife and I did a Savage Race in October of 2014, 5 months after I decided to “get up off the couch.” It was the first milestone in my health and fitness journey. The baby steps had added up to something I could finally see. I won’t soon forget the sense of accomplishment and the joy of doing that with my wife. What are your biggest strengths and weaknesses in terms of racing and training? How are you working to overcome them? My biggest strength is determination. I’m constantly looking for way to improve, new baby-steps to take, new challenges. My biggest weaknesses are specific to American Ninja Warrior: balance, upper-body endurance, and cardio endurance. Currently, I am attacking the balance weakness by doing a lot of slack-lining and searching for any opportunity to jump from one thing to another and balance myself. Attacking the cardio endurance weakness is pretty straightforward: run. I hate running for the sake of running. 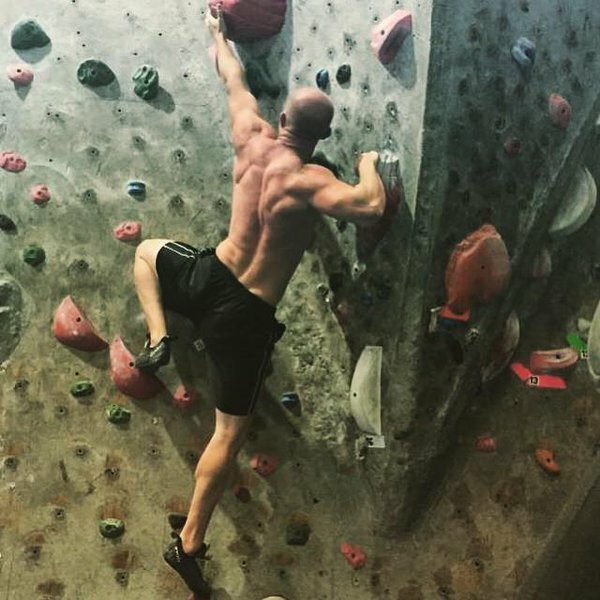 To work on upper-body endurance I recently got “lead certified” at my local rock climbing gym, which has opened up a whole new way of training upper-body endurance. You started training seriously in your mid-30s. What advice would you give for people watching ANW and OCR shows on the couch but are afraid to give it a shot? It is never too late to start. In May of 2014 I couldn’t get off the couch without taking 30 seconds to slowly straighten my back. Within five months, I was running an OCR with my wife, within a year I tested the American Ninja Warrior Orlando course, and within two years I was officially running the American Ninja Warrior course. It seems so hard to believe that it was only two months ago when I was lying on the couch watching American Ninja Warrior thinking, “I could never do that.” All I had to do was take the first step: get off the couch, talk to a friend who developed a training schedule, get a membership to the gym, wake up each morning at 5:00am, and just go. One step at a time, and then two years later I look back and can see how far those individual steps have carried me. 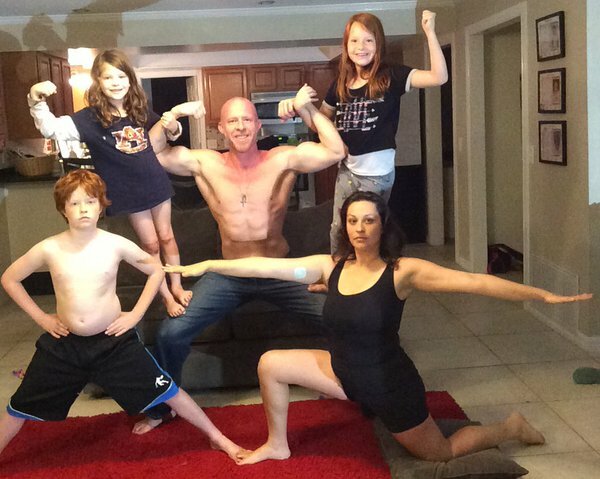 Nearly every parent I talk to about OCR mentions that their kids love American Ninja Warrior. Should more parents consider letting their kids train for OCR rather than the typical youth sport options (baseball, basketball, etc.)? I think team sports have their place for sure. I learned so many life lessons from team sports, but youth sports have changed a lot over the last 30 years. It’s not that good leagues don’t exist, but I’ve been personally disillusioned by the current state of youth basketball in particular, which I was very active in when I was young. Having said that, I think every parent has to make decisions on what’s best for their child. For some parents, it’s simply about providing an opportunity for your child to not be in front of a television. For others, your child may thrive in a competitive team environment. And some kids just love doing obstacles. For me, at the end of the day, it’s about finding what my kids enjoy and providing that opportunity for them to excel. Have your kids competed with you yet? They go regularly with me to Ninja Warrior competitions at gyms and backyards, but we have not raced together at an OCR. I just told my wife last week, “We need to do an OCR as a family,” so maybe soon! Events like the Spartan Kids, Savage Race Jr., and BattleFrog Tadpole race are designed to get the next generation of OCR athletes interested in the sport. What improvements would you make to market and engage kids better for these events? I got an email last week from Savage Race about a “Father's Day” special pricing and clicked on the link to learn more. It was from browsing around the website that I learned that such a thing even existed. I would think it would be quite easy to find/sponsor some OCR athletes who are parents that would specifically get the word out on social media about the kids’ events at OCRs. If that were happening, I would certainly know about it before now. Where do you see the OCR industry in five years? Like anything else, it will have evolved. Maybe it’s a more of a merging of Ninja Warrior and OCR by taking the team elements of OCR and adding that to the new Team Ninja Warrior, with the obstacles becoming more extreme. Maybe it’s adding elements from Iron Man or track-and-field. What I do think will happen is that it will continue to grow. OCR is a great way for the non-professional athlete to set a goal, work hard, and enjoy the fruit of their hard work. Did you play any sports competitively growing up? What were some of your accomplishments? Basketball was my primary sport. I started playing competitively when I was 12-years-old and ended being very successful for the small private school I attended in the Washington DC area. I was the Washington Post leading scorer for private schools my senior year at 26 points per game. I also started playing soccer my junior year of high school and found that I had quite a knack for goalkeeping. Do you have any replica obstacles at home to help you prepare for the ANW course? Unfortunately, I have not yet built any obstacles in the back yard. We just moved to a house where the HOA will let me build obstacles (our previous HOA would not permit it), so I’m hoping to get started on obstacles ASAP! Until then, I continue to rock climb three times a week at a local gym, do plenty of pullups on my pullup bar, slack-line, look for local competitions to participate in, and go running with the kids in the evening. You name it, I’ll try it. Walk me through a typical week of you working out. Do you have any training partners or coaches? A typical week is rock climbing Monday/Tuesday/Thursday during my lunch break at a local rock climbing gym, 5-minute sets of pushups/situps every hour while at work each day, and running at night while the kids follow on their bikes 1-2 times per week. I also do pullups at least twice per week at home, pushups/situps/pullups on either Saturday or Sunday while I’m cooking chicken on the grill for the coming week’s meals, slack-lining with the kids whenever I can, and just looking for fun stuff to do whenever I’m outside. Finding another tree or rock to climb somewhere with my family. Who are your favorite American Ninja Warrior competitors? Have you met any of them in-person? I have several. Reko Rivera and Shaun Murray are good friends of mine. Tyson Pfeifer went to high school with my wife and is now a friend of mine. But I also really respect a few that I don’t know well, like Travis Rosen, Jon Stewart, and Geoff Britten. I’ve met Geoff and Travis, though haven’t spent a lot of time with them. Every interaction I’ve had with them has been great, with Geoff even giving me tips over Facebook messenger on more than one occasion. Choose one: do you love to win or do you hate to lose? Not sure if it would impress most people, but I’m fairly musical. I sing, play the piano, and play the drums, though none of them great. I’m a mile wide and an inch deep, but playing in the worship band at my church is one of the greatest joys in my life. I can gleek like a champ and blow bubbles off my tongue. Oh, and I can twirl a pen around my thumb. Pretend you’re in charge of designing the course for American Ninja Warrior next year. Describe your dream course and the most important factors into making a fun and challenging course. I think the really cool thing about American Ninja Warrior is that you don’t know what you are going to face until you see it. So whether it was running in Atlanta or watching all the other regions on TV, I think, “Oh, I wish I could do that course!” So you really can’t go wrong!